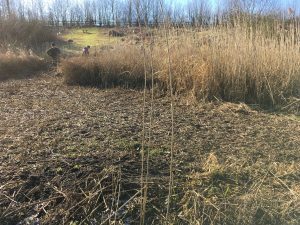 We started cutting the reedbed during January and February 2018 to encourage it to grow and thicken up for wildlife that lives in there. Ideally about a third of the bed should be cut each winter so there isn’t too much disturbance, then it should grow back thicker and may even be encouraged to spread. 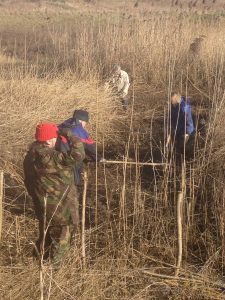 We’d like to encourage the reed bed to spread too, to encourage species that nest here such as reed warblers to thrive. This work has to be done at a quiet time of the year when the birds are not unduly disturbed by the activity and nesting is not taking place. Reed is relatively easy to cut in winter, this is done with a scythe, then raked out. 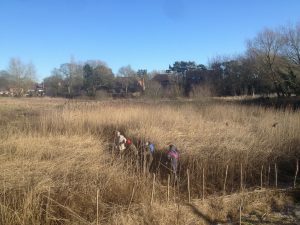 The picture on the right shows the reedbed when the cutting and raking had been done last year. It grew back very quickly and it was difficult to see the cut section by the autumn. This winter 2018-19 we have done another third of the bed.